The stars of awesomeness aligned, bringing five bumping stabbers of the New Order into the same ice field at the same time. As they teamed up to enforce the Code in Kino, the despair of the rebel forces reached critical mass, triggering a major miner meltdown. Now our heroes were presented with their most difficult mission yet. Could they restore order to the system and keep the peace? Despite the tumult, we had to launch an investigation into the source of the miners' anger. I took point. 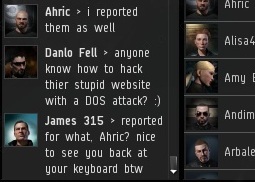 After all, I didn't become the Saviour of Highsec to take the easy assignments. Every lead we followed came up empty. 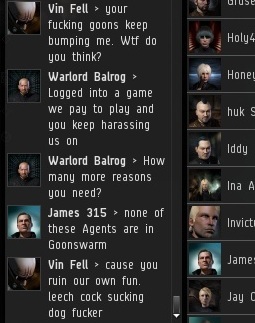 Miners were convinced that the GoonSwarm Federation was somehow to blame. 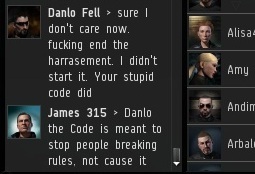 For some reason, they thought the Goons weren't able to make a go of it in nullsec and had to come to roost in Kino. With no easy answers at hand, we had no choice but to try and staunch the bleeding. For starters, no profanity in local. An innocent kid could see it, and then we'd all have something extra to carry on our conscience. It was no use. Thinking quickly, I decided the only way to decipher the mystery of Vin Fell was to do some research and find out who in blazes the man was, and find out what made him tick. Maybe then I could figure out how to put the pieces back together--if it wasn't already too late. I didn't have much to go on, and what I did have didn't make much sense. His bio suggested a man of peace and poetry, nothing like the volcano currently raging in local. Next, I looked at his corporation info. He was from "a laid back", "anti-drama corp". That didn't add up, either. 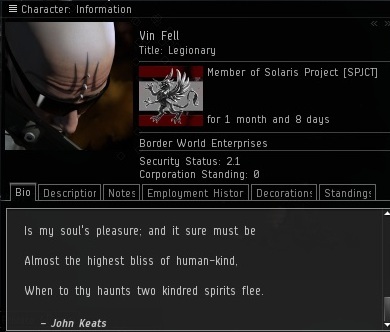 He was a long way from Poinen and the Great Wildlands. 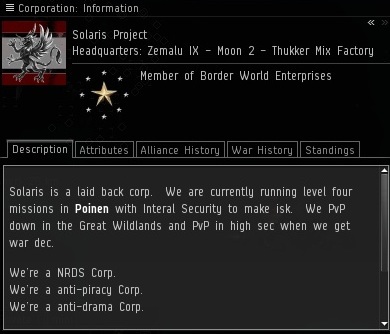 Also, his corp was NRDS, which is totally lame. I had spent precious seconds on a research project that had gone nowhere. But if this really was the same Vin Fell tearing things up in New Order space, maybe the key was to make this guy remember who he was. It was time to hit the "reset button" on our diplomacy. ...But wiping the slate clean was easier said than done. I was reminded that diplomacy is a two-way street. Both parties need to want progress. Kino was swirling around the drain. For the first time, I didn't know what to do. Getting on his alt, Danlo Fell, Vin exhibited more signs of typical "rock bottom" (no pun intended!) 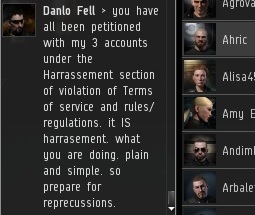 behavior for miners: Petitioning, sending multiple petitions, and asking for help to hack my website. Then the miner began to attack the Code itself. Insult me all you like, I can take it. I've probably heard worse than anything you can dish out. But don't speak ill of the Code. That ain't right. The fire was burning out of control in Kino, and all we could do was sit back and watch. ...There it was. 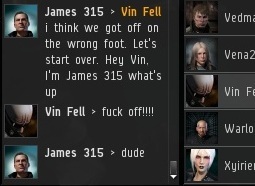 The desire to mine AFK. 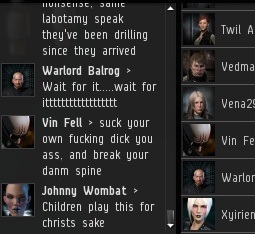 The miner's greatest wish, to become a bot and make endless space money with no effort or risk. That's what it was all about. Man versus Machine. He had become like the bots he envied so much--had become more machine than man, really--and when he saw humanity make a comeback in Kino, he was consumed by internal conflict. The only thing that could save him was for his system to "reboot", as it were. One final, gurgling gasp of energy, and then... It was over. We didn't hear from Vin again that day. I hope he was able to make peace with himself. 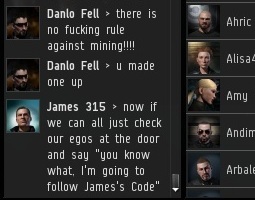 I still hope that someday he will replace the programming code of the mining bot with the true Code of highsec. 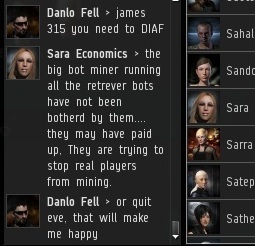 The Code that frees miners from the false temptations of bottery, and helps them remember what it means to be human: To live and to love, and to pay me 10 million isk. Don't you ever stop working your magic, James 315. Even if all this movement would do was creating reads as entertaining as this gem, it would well be worth it. Agreed on that; definitely continue whatever the outcomes are; as long as you don't get threatened in real life. 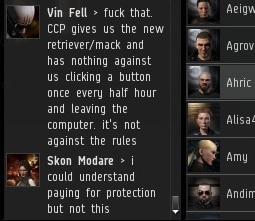 I don't like the AFK miners in my corp too, they never talk. It's like they're ghosts instead of players. The movement cannot be stopped now. How does one fight against an idea? Nice to hear you've had a good experience with bumping, Maboat. 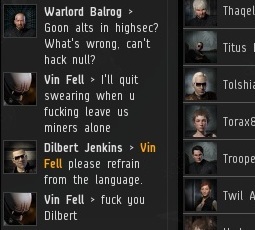 I find that miner attitudes tend to improve with each bump. I find that this is very related to the miner problem. 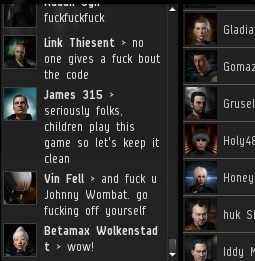 Even wise old men are against AFK miners. A very appropriate movie quote! I must have been channeling Obi-Wan when writing my description of those bot-aspirant miners. Keep up the good work James. Thanks for not just giving logs but even screenshots of locals. 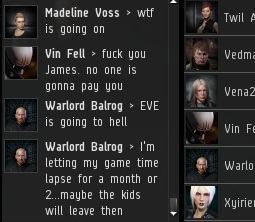 Sometimes re-learning EVE is painful. Oh this is Alavaria (yes, I'm a goon).